Serve up this keto chicken al a king recipe tonight for dinner. A low carb chicken al a king recipe that the whole family can enjoy. 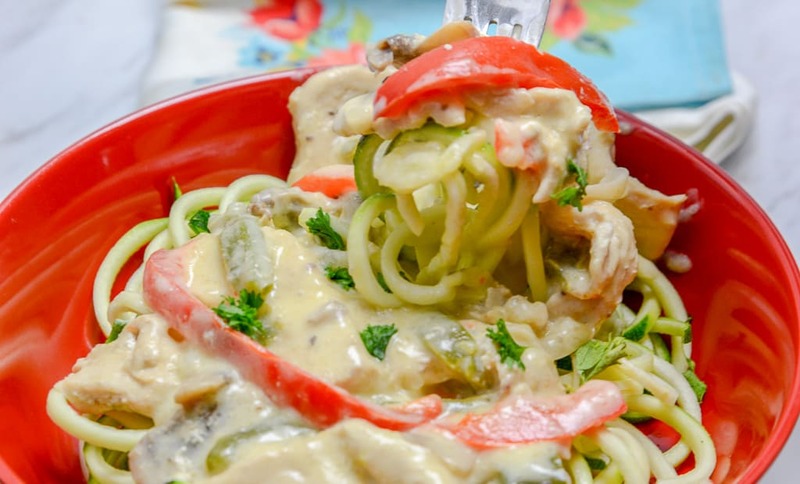 Zucchini noodles topped with chicken al a king. What is Chicken a la King? 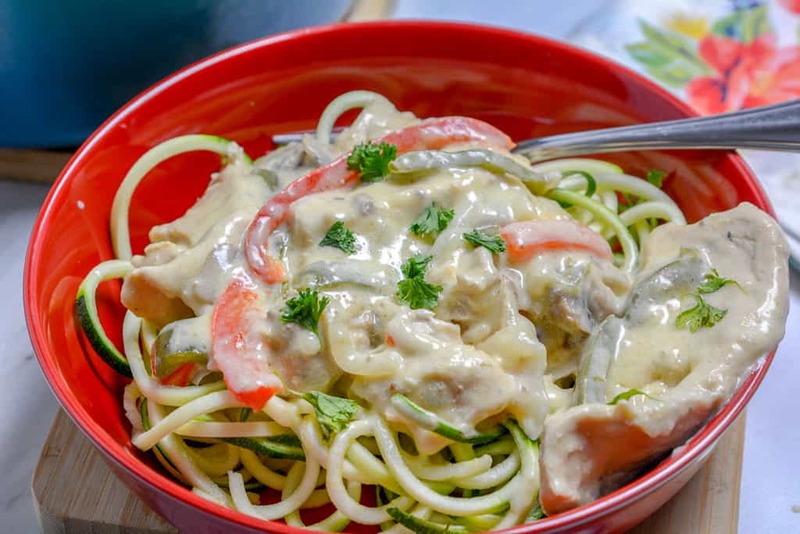 Chicken a la King is a meal that consists of chicken in a cream sauce with veggies that is usually served over rice, pasta, or bread. 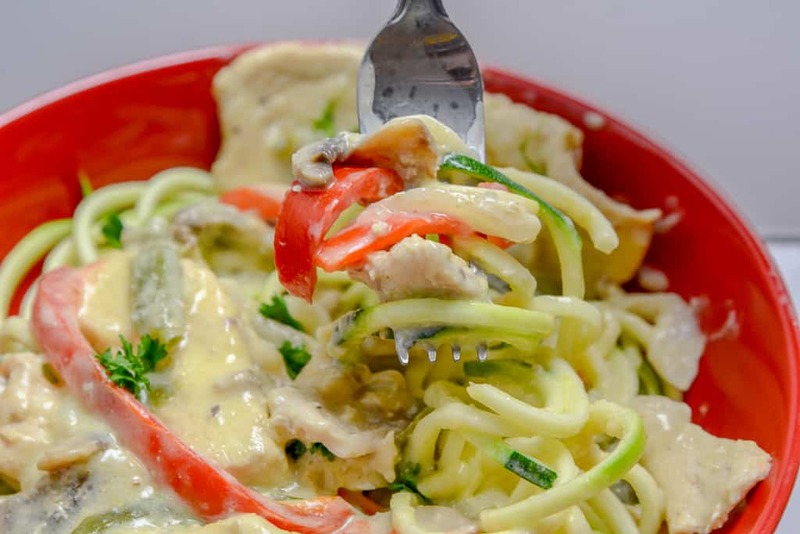 It’s easy to convert this recipe to a keto friendly recipe by serving it over zoodles! Is there a Chicken a la King casserole recipe? This would be easy to make this into a casserole by simply adding cauliflower rice as a first layer in a casserole dish and this mixture over the top. You could also top is with a layer of cheese for a nice golden crust too! Is Chicken a la King Soup a recipe I can make from this recipe? Yes, you can make the cream part less thick by simply adding more broth to this exact recipe. I suggest chicken bone broth. This recipe dates back to the early 1800’s! There are claims of four different people who have made it. The Chicken a la King recipe was mentioned in the New York Times back in 1893. It became a very popular dish during the middle to the late 20th century. I was able to find this information on Wiki. How is Chicken a la King served? 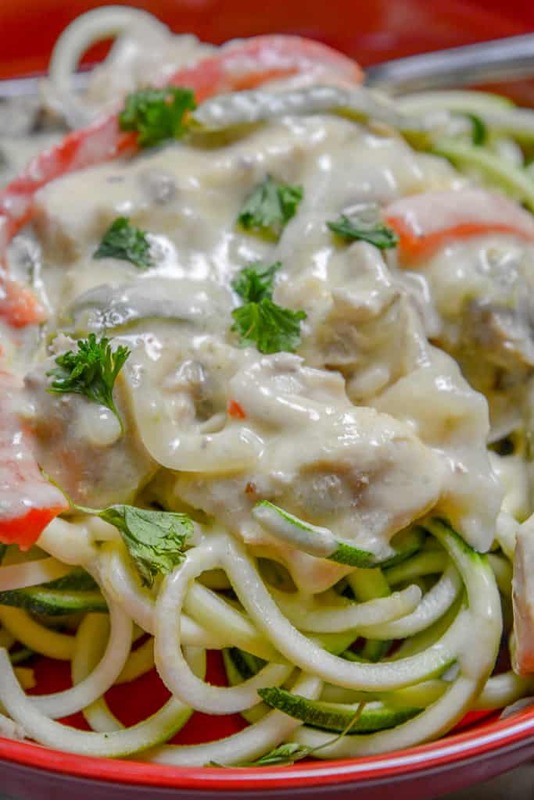 Because we try to keep all of our meals low carb and keto friendly, we serve this dish over zoodles, cauliflower rice or even steamed broccoli! If we fill the need to have a bread type recipe with this, we make the Keto Cloud Bread recipe to go as a side. Cook mushrooms, onions, and peppers in butter till tender. Add the seasoned chicken to the peppers and cook until done. Now add the heavy cream, chicken broth, and cheddar cheese. Serve over zoodles, cauli-rice or your favorite veggie! 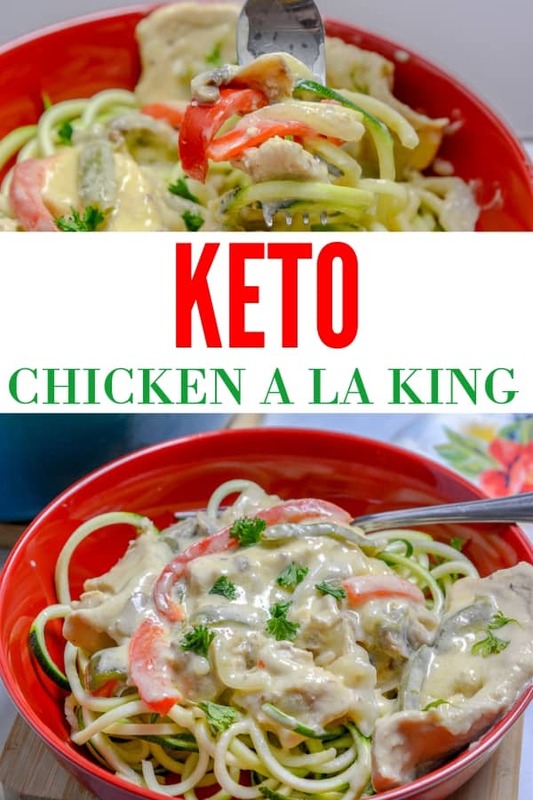 Have you made Keto Chicken a la King Recipe before? By Jennifer on October 5, 2018 Keto Dinner Recipes, Keto Friendly Recipes, Keto Lunch Recipes, Low Carb Recipes, Main Dishes, Recipes.